Aside from endless variations of tower defense, there are few genuine strategy games to choose from on the Android Market. One of those few, Battle for Mars, from Larva Labs, is one of the best available on any platform! Battle for Mars offers a long single-player campaign, "quick-start" skirmish scenarios, many unique units to choose from, and wonderfully executed pixel art. Battle for Mars clearly owes quite a bit to the Advance Wars series (available on the Nintendo DS) in visual style and game play but is polished enough to stand on its own rather than as a knock-off. Like other games of the genre, the game play is simple in theory and extremely complex in practice. 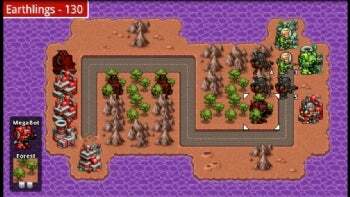 The player moves units (soldiers, tanks, and such) around a map to destroy the enemy's units and capture their facilities, one "turn" at a time. Each turn allows each unit to perform some number of actions (moving, attacking, or whatever). As you capture cities and factories, you acquire resources to construct more units; capturing the last enemy base wins the game. Each unit has special abilities and weaknesses; mastering them all takes time and patience. Luckily, a very good "help" menu explains the basic game-play mechanics in detail and offers profiles of all the available units. The newest version of Battle for Mars also has multiplayer support, but this can be a little confusing for new players since it allows several turn-based multiplayers join simultaneously. I understand the utility of this feature, but I'd also like the option to play head-to-head directly with another player. Interestingly, Battle for Mars wasn't always one of the few games of its kind on the Android Market. Those familiar with the genre may recall the game Military Madness, which predated the Advance Wars franchise, and was ported to the Android Platform by the original developers. At the time of writing, Military Madness seems to have been pulled from the Android Market, which is frankly just as well, because Battle for Mars is superior in nearly every way, outside of pure nostalgic value. Battle for Mars, from Larva Labs, is one of the best strategy games available on any mobile platform! Battle for Mars offers a long single-player campaign, skirmish “quick-start” scenarios, many unique units to choose from, and wonderfully executed pixel art. It can be a little confusing for new players since it allows several turn-based multiplayers join simultaneously.